the happy one has no problems with the friend…the sad one has peoblems with his friend..the onwer of the cafe ask where you were and she said that you cant get up in the morning…is that true..where are you? 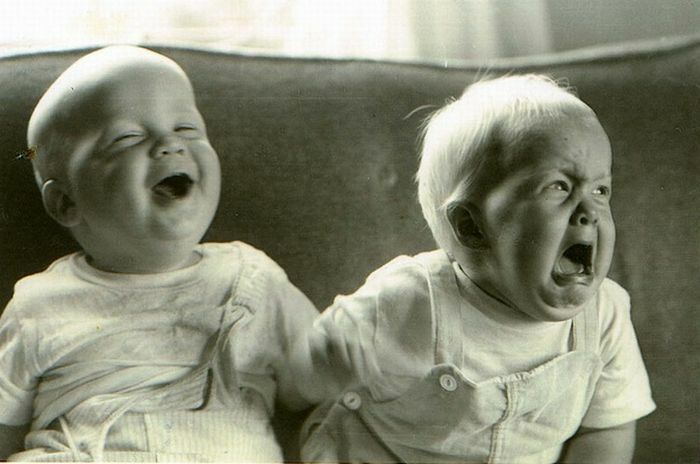 The laughting one just pinched the crying one and now thinks it is sooooo funny. Just wait….He will get you back when you least expect it! And before he pinched me, he took my chocolate. Twins. The good twin versus the bad twin. Me and my cousin Cindy (Cindy on right) – I had in fact just pinched her when my dad took the picture 52 some years ago. Can I use this picture in my presentation please?